Laura Scott is an ultra-endurance cyclist, who grew up moving between England and Canada. In 2016 she took part in a solo unsupported bike race across the US called the Trans Am Bike Race, completing 2,200 miles with a dislocated shoulder and fractured collarbone after being hit by a car on day one. She has also taken part in numerous other long distance events and will be racing the Trans Atlantic Way in Ireland this year. 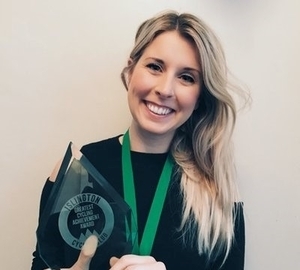 Laura hopes to inspire more women to take up cycling and give endurance racing a go by sharing her adventures. "I am so honoured to be invited to be a patron of Bike 4 Cancer. 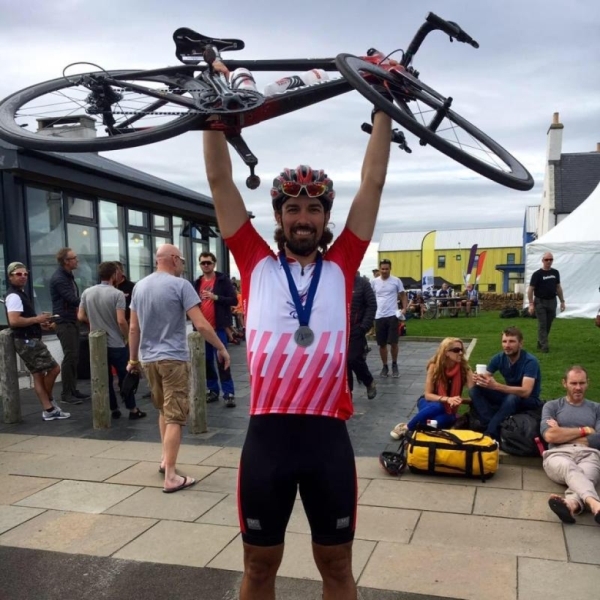 Cycling is such an important part of my life, and after losing my father in 2017 to brain cancer, it was important to me to find a way that I could feel as though I was helping to make a difference. I am glad to be able to help Bike 4 Cancer enable cancer patients and their families to participate in cycling, and hope as a Patron I will be able to raise more awareness and support for this wonderful charity." Nathan was a professional Badminton player for almost 20yrs representing England over 100 times and Team GB at 3 Olympic games. His achievements include - Olympic Silver Medal, World Champion, Commonwealth & European Gold medallist and former World number 1. 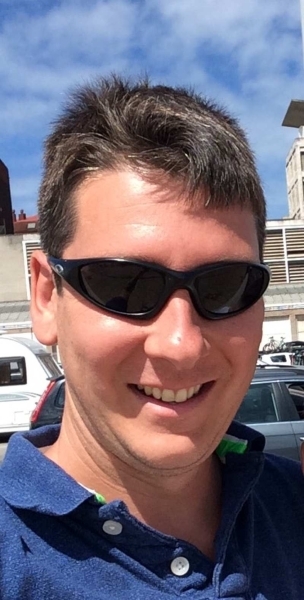 Since retiring from Professional play in 2012 Nathan has helped launch the first professional Badminton League in the UK and also does tournament commentary and coaches England junior squads. He is also a member of the Team GB athletes commission assisting in delivering our teams to Olympic and Winter Olympic with the best chance of achieving medal success. 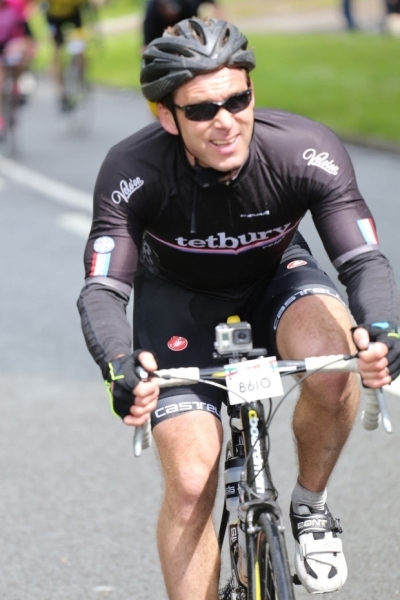 "I am delighted to be invited to be a patron for Bike 4 Cancer. I have done multiple fundraising events in the past from distance bike rides, badminton events and golf days but cycling is my biggest sporting passion so to be able to raise funds for Bike 4 Cancer and also join those families that Bike 4 Cancer are supporting on their breaks and days out is something I am very keen to do and help make those moments special. I look forward to being a very active member of this worthy charity." In 1999, Harvey founded “Wiggle”, the online cycle retailer and remained as Managing Director until 2009. Over that decade, wiggle grew to employ over 100 people and export cycles and accessories worldwide. In 2004, ISIS, a Private Equity company, acquired a stake in Wiggle and helped professionalise the company. This gave Harvey the opportunity to learn a new level of business organization and develop skills that he believes are transferrable to other sectors. After leaving Wiggle, Harvey went sailing for a year around the Atlantic, spending a summer in the Arctic among the whales, icebergs and Inuit. Since then, he has become a Trustee of ClientEarth, an environmental law organisation, and founded the Pig Shed Trust, a charity that funds work to create a naturally flourishing world. 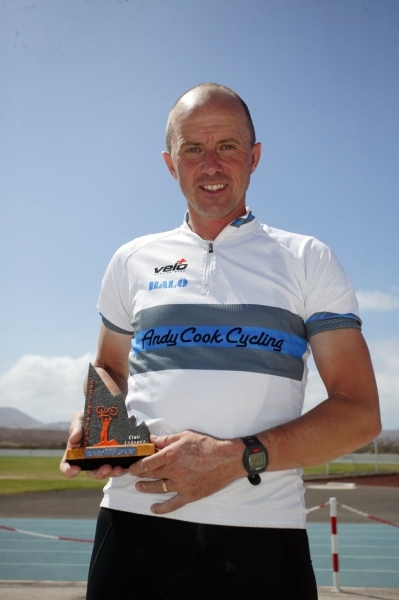 Andy previously competed for GB back in the late eighties/early nineties, held a number of National cycling records and won a number of individual National Championship medals. However, Andy is "Mr Cycling" and whilst competing is one end of the spectrum, his involvement with the sport and pastime goes far deeper and entails coaching novices and cycle training for school children and adults and other grass roots cycling events. Andy also holds many senior positions within a wide range of road cycling organisations having worked for British Cycling and previously been National Chairman of Cycling UK as well as President of the "Cycling for All" UCI Commission. "I am honoured to have been invited to be a Patron of Bike 4 Cancer. I am acutely aware of how hard the charity works to raise much needed funds for cancer treatment and research. The work that the 4 Cancer Group carries out to enable cancer patients and their families to participate in sporting endeavours is only to be admired. 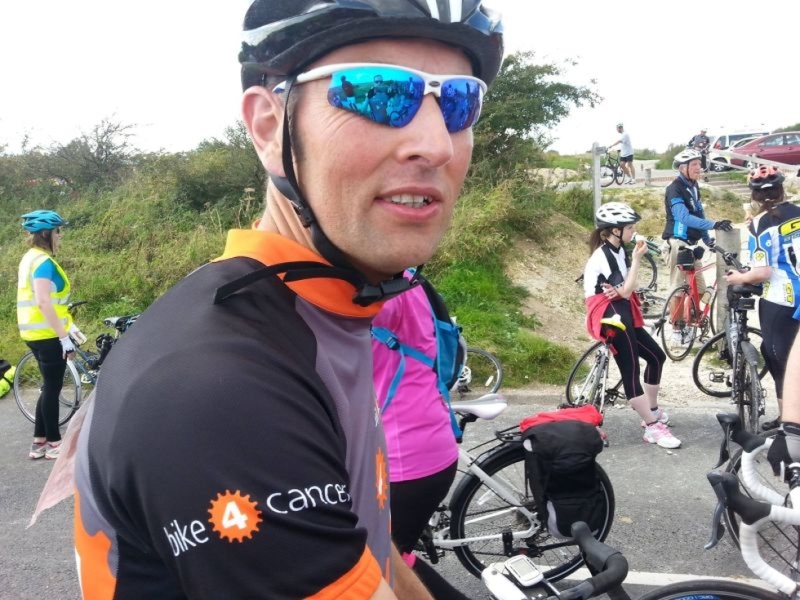 I hope as a Patron I can help to raise more awareness and support for this deserving cancer charity particularly through cycling events, experiences and activities." Rich has been a long term supporter of Bike 4 Cancer since he helped launch the charity when he rode the route of the 2009 Tour de France in memory of good friend, Caroline Dubery, who lost her battle with cancer aged 32. 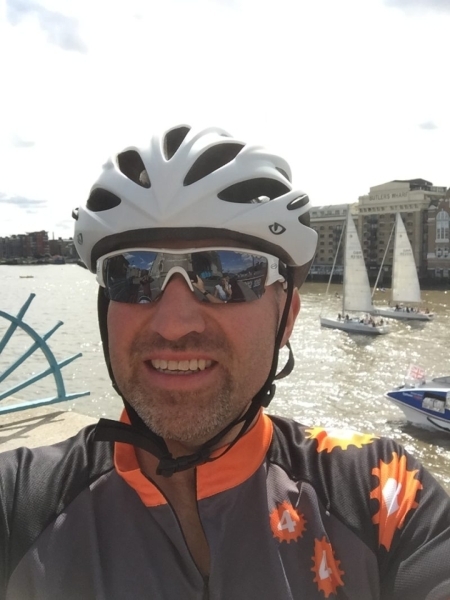 Rich loves cycling and taking part in ever more adventurous and challenging events from Ironman Triathlon to Coast to Coast cycles / kayak events. He was the guinea pig for the first Bike vs Boat challenge in 2015 where he competed a solo 225 mile ride. Rich helped to establish Rampage Velo Events who now provide corporate cycling experiences at the London VeloPark. Rich is Regional Sales Director for US security vendor, Gigamon. His role encompasses managing a number of large clients in the UK and in Ireland where he is the Country Manager for Gigamon. He is extremely proud to be an Ambassador for Bike 4 Cancer and to play his part in improving the lives of people affected by cancer. Andy is a keen cyclist, sailor and skier and has been an avid supporter of the 4 Cancer Group for many years, from selling raffle tickets at Cowes week, taking part in the Southport 24 hour dinghy race, skiing the vertical height of Everest and of course taking part in the popular London 2 Brighton bike ride all to help raise money and awareness for a very worthwhile charity. 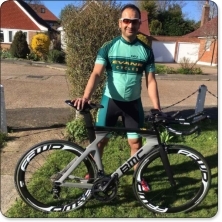 Graeme is a highly experienced Personal Trainer and Sports Therapist specialising in helping people of all abilities improve their cycling and running fitness. 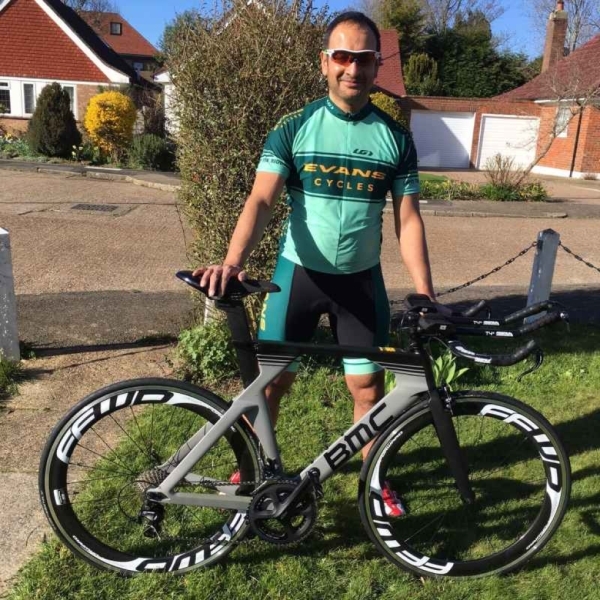 His experience and knowledge of endurance training and nutrition has not only seen him work alongside major sports brands such as Brooks Running and Science in Sport (SiS) but also given him the chance to help thousands of people train for iconic endurance events such as the London Marathon and RideLondon. Graeme is Author of six Running and Fitness books, including the bestselling “The Marathon and Half Marathon: A Training Guide,” a book which BBC Newsreader and prolific marathon runner Sophie Raworth ranked as one of her top five favourite books. His books have been sold worldwide and translated into several languages. A highly sought after presenter, Graeme also offers health and wellbeing talks and consultations for leading companies to help raise awareness of the benefits of exercise and nutrition to improve physical and mental health. His passion for improving people’s health and wellbeing by training for running and cycling challenges makes Graeme a fantastic Ambassador for Bike and Run 4 Cancer. Find out more about Graeme here. “I am a long-time supporter of Bike 4 Cancer and so I am very honoured to have been asked to be an Ambassador the charity." I have always loved cycling from an early age right up to my early twenties when my children came along and responsibilities took over. I then no longer had as much time to spend going out on my bike, other than for family rides to parks and the odd pub! 3 years ago I got back into cycling after being given the opportunity to ride the London to Brighton for the British Heart Foundation. This was the kick start of my passion for cycling which has resulted in me losing over 3 stone in weight and living a healthier and fitter lifestyle. In 2011 my family went through the most tragic times when I lost my mother-in-law to cancer following a 2 year battle. After seeing the devastation and heartache that cancer causes, I wanted to do something to raise money and awareness which was cycling related and would benefit a cancer charity. This is when I came across Bike 4 Cancer. The charity does amazing work for families with loved ones whom are fighting cancer so I immediately signed up for the September London to Brighton. From then I have cycled it every year and I have also got my dad (who is in his 70’s) involved and he has now cycled it 3 times. Cancer is still destroying families and lives across the UK. It makes you feel useless and devastated to see family members going through treatment and friends whom have lost loved ones, so when I was asked to be an Ambassador for Bike 4 Cancer I was totally honoured and feel so proud to be an Ambassador. So what does the future hold for me? Well, I am now looking to take my cycling to the next level, and I would like to start racing in crit races along with doing bigger events for Bike 4 Cancer which will hopefully raise the profile of this amazing charity and take it to the next level. If I can help families with respite breaks and trips by cycling my bike then there is no better feeling of achievement so hopefully I will see you on the road soon and together we can help others through Bike 4 Cancer." 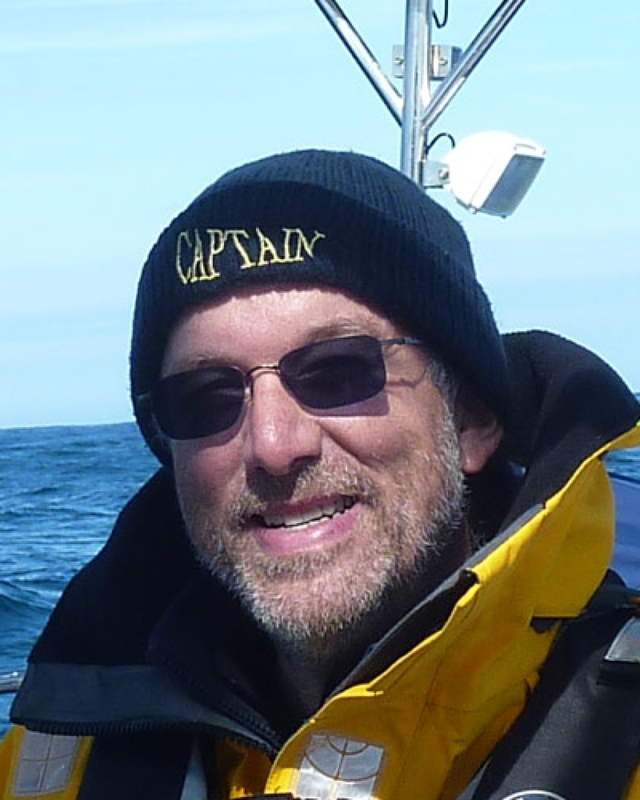 "After many years working in IT I took the decision to do a complete career hand-brake turn. At an age when you should know better I gave up full-time work and enrolled at Brighton University to do a Sports Journalism degree. One or two sticky moments aside it has been the best decision. 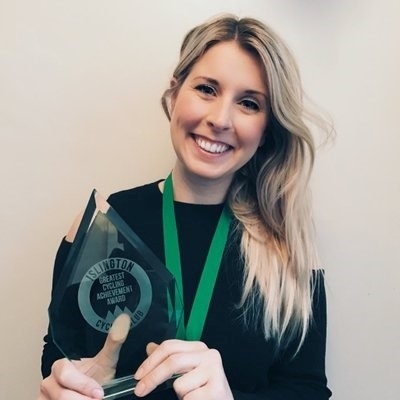 I left clutching a degree certificate and armed with a whole load of new skills I took up a Press Officer/IT role with the governing body of World Snooker. I spent four years travelling to far flung places and embraced my new role. However, with a young family I needed something closer to home. At the same time, I re-discovered my love of cycling and then had a slice of luck when I got a job within the cycling industry. I could now combine my job with my hobby. "If you ask people who know me they may say it is the other way around now. My hobby is my job and I get to live and breathe what I am passionate about. My passion for cycling has led to some terrific memories, enjoying great rides and plenty of camaraderie along the way. I have ridden L’Etape, the stage of the Tour de France for amateurs, La Marmotte, Paris-Roubaix, Liege-Bastogne-Liege, Amstel Gold Race, Tour of Flanders to name but a few. More recently I have ridden for Great Britain at the amateur Road World Championships in Denmark, I qualified again last year but with the event held in Australia even I couldn’t manage that one. I ride and write reviews for www.cyclosport.org and other websites. "I now feel I can use this experience to not only spread my enjoyment of cycling but to help others. When I was asked to become an Ambassador for Bike 4 Cancer I didn’t hesitate in accepting. It will be a proud achievement as like many others I have seen family taken by cancer, it is time to do something about this. See you on the road or for a coffee." "Following an initial career in agriculture I joined the Metropolitan Police and served in various parts of North and Central London mostly in the CID. I spent 14 years dealing with current and historic allegations of child abuse before my career was curtailed by two years following my diagnosis with cancer. My diagnosis followed a cycling accident in London and in hindsight the early diagnosis has probably given me a far greater life expectancy than if it had gone undetected. Having left the Police following this life changing event along with my partner Sarah we took on a village pub in Somerset at the same time that i was undergoing my chemotherapy, some say mad but it kept me going through the bad times, as, to be honest ,I didn't have time to feel ill!!! I began cycling again and decided i needed to give something back. I looked for a worthy cause and Bike 4 Cancer just fitted the bill perfectly and following meetings and discussions with Charlie from the charity the partnership was formed. We started by transporting 30 riders from Somerset to London for the London to Brighton event which proved very financially successful . It was on the return journey that i thought, i can organise this myself and in 2017 we had the first 3 counties coast to coast event with 100 cyclists going from Minehead on the North Somerset coast to Charmouth on the Dorset coast, a total of 75 miles. 2018 will see the third event hopefully with more riders and should then become an annual event. To be asked to be an ambassador for Bike 4 Cancer is an absolute honour and pleasure." 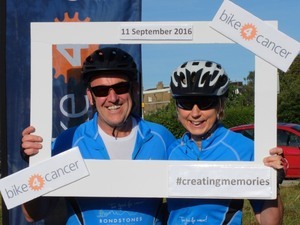 "Having grown up in a very rural, hilly village, cycling was the furthest thing on my mind until my Partner, Paul and I got involved with Bike 4 Cancer following his cancer diagnosis and he mentioned to me that 'we' were cycling London to Brighton. My first thoughts were 'I can't cycle that far'! However, the steep Devon hills proved invaluable and after many hours of practice and sweat we conquered the challenge and cycling became my new hobby. As a child I was always called a 'chatterbox'.......this together with working in hospitality for most of my life and having a disabled child has made me patient and compassionate about helping and understanding people who go through difficult times. 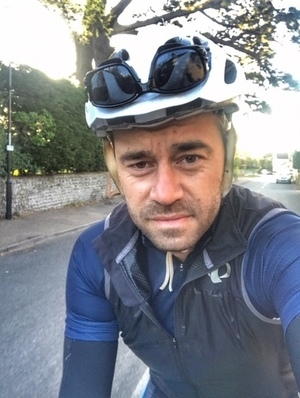 Bike 4 Cancer has show me that 'a little bit of effort goes a long, long way' and I am extremely proud to be an ambassador for such a fantastic cause." Cycling has always been a part of my life. For 10 years I lived in Wales and was based within 30 minutes drive of the likes of Coed Y Brenin, Climach-X and Llandegla. I would also travel the UK to ride the parks of Scotland and the Lake District. Most weekends it was all about the trails and how muddy I could get. Then an idea came about to ride John O Groats to Lands End, on a full suspension mountain bike! In total the trip was 12 days, no records set but I thoroughly enjoyed the mileage, so a seed was set. Time to buy a road bike. My love for road cycling took off and have since ridden Hull to Liverpool, several sportives across the UK and can often be found riding the hills of West Sussex. I have been lucky enough to be a bike guide for an events company and I have led over 10 London to Paris 3 day events. Ridden Paris to London, been part of a team to ride from Oxford to Venice, supported runners for a BBC One Show event and guided a London to Liverpool charity event. I love the freedom the bike gives me and enjoy the peace and tranquillity I can get as I ride. It brings a sense of well being. Cycling has led me to take part in numerous triathlons too, ranging from Sprint distance right up to Ironman distance. I always thought that I wouldn’t be affected by cancer. No one in my family was diagnosed, then one day I got that call. In 2018 my Uncle was diagnosed with terminal cancer. His back pain that had been bothering him for sometime was actually cancer of the spine and soon liver cancer. He fought hard for 4 months and sadly in July 2018 he lost his battle. I’m truly honoured to be asked to be an ambassador for Bike 4 Cancer, I hope that I can raise even more awareness for the charity and raise the vital funds to help people with this dreadful disease.